Metamasius mosieri Barber is native to Cuba and the Dominican Republic and likely to southern Florida. Until recently, it was rarely collected in Florida (most likely because until recently no specific effort was made to find it). It has been reported from Collier (Corkscrew Swamp, Rookery Bay, Collier-Seminole State Park, Fakahatchee Strand), Glades (Fisheating Creek), Hendry (LaBelle, Big Cypress Seminole Reservation) Sarasota (Laurel), Lee, Dade, St. Lucie and Osceola Counties. 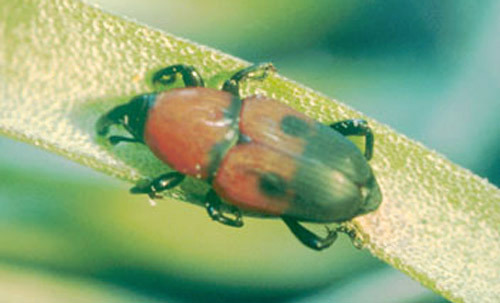 The Florida bromeliad weevil is an occasional and minor pest on ornamental bromeliads and occurs at very low population densities in its natural habitat. 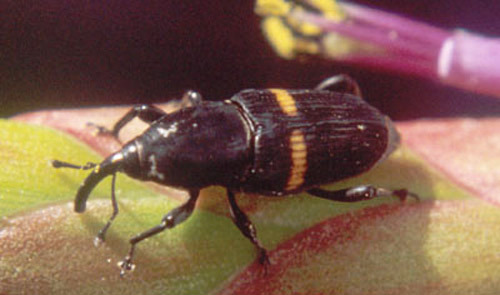 It should not be confused with the Mexican bromeliad weevil, Metamasius callizona, which is currently attacking five species of native bromeliads in 16 counties and will likely destroy populations of seven additional species of already-threatened or endangered bromeliads if not brought under control. Figure 1. Adult Metamasius mosieri Barber, the Florida bromeliad weevil. Photograph by B. Larson, University of Florida. The Florida bromeliad weevil is considerably smaller than the other two species of Metamasius weevils currently found in Florida. The adult is 6 to 11 mm in length, with males usually slightly smaller than females. Adults are red and black, with most of the thorax and upper half of the elytra being red, and they have two black spots about midway on the elytra. There is some variation in the size and shape of these spots, and occasionally two additional, smaller black spots are present above them. In Osceola County, a darker color form has been observed, which is nearly all black except for a thin, red line on the thorax dorsally and red coloration on the head. The Florida bromeliad weevil can easily be distinguished in the adult stage from the Mexican bromeliad weevil, Metamasius callizona, and the silky cane weevil, Metamasius hemipterus (L.), by both size and coloration. Larvae of the three species are similar in appearance, except that mature larvae of Metamasius mosieri are smaller than those of the other two species. Figure 2. Adult Metamasius callizona (Chevrolat), the Mexican bromeliad weevil. Photograph by Olan Ray Creel. Figure 3. Adult Metamasius hemipterus (L.), the silky cane weevil. Photograph by B. Larson, University of Florida. In Florida, the weevil has been found most commonly on Tillandsia balbisiana, Tillandsia utriculata, Tillandsia variabilis, and Tillandsia setacea, although it also occurs on several additional species of native bromeliads (family Bromeliaceae), including Tillandsia fasciculata, Tillandsia simulata, Tillandsia paucifolia, Tillandsia flexuosa, Tillandsia bartramii and the natural hybrid Tillandsia. x smalliana. 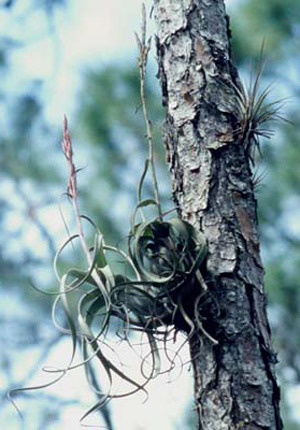 When it occurs on larger species such as Tillandsia utriculata and Tillandsia fasciculata, it appears limited to seedlings and immature individuals of those plants (generally up to about 16 cm from leaf base to tip). It has also been observed in grower shadehouses to attack some small species of Tillandsia exotic to Florida, including Tillandsia bergeri, Tillandsia bulbosa, Tillandsia concolor, Tillandsia geminiflora, Tillandsia gardneri, Tillandsia hondurensis, Tillandsia ionantha, Tillandsia jucunda, Tillandsia rhomboidae, Tillandsia streptophylla, Tillandsia stricta and Tillandsia vernicosa. Figure 4. Tillandsia balbisiana Schultes, one of the principal host plants of the Florida bromeliad weevil, Metamasius mosieri Barber. Photograph by B. Larson, University of Florida. Development time appears to be somewhat longer than that of the Mexican bromeliad weevil. Observed development time under ambient conditions in St. Lucie County from egg to adult has ranged from 18 to 22 weeks. All stages of Metamasius mosieri maintained in St. Lucie County have been observed to survive four- to six-hour periods of freezing temperatures (-1.1°C or 30°F), as well as temperatures up to 35.5°C (96°F). The weevil remains active at temperatures between about 12.8°C (55°F) and 32.2°C (90°F). Adults feed externally on leaves, and they may also feed on flower stalks and inflorescences as do adults of other weevils that are specialists on bromeliads. Females of the Florida bromeliad weevil deposit eggs singly. 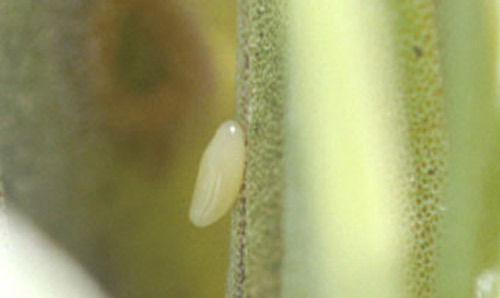 The eggs, which are approximately 3 mm in length, have been found both on the surface of leaves in the center of the plant and within slits in the leaf made by the female. Females generally lay one egg per plant, and when more are laid on a single plant, cannibalism in the larval stage usually reduces the number of individuals to one per plant. Adults are known to survive at least eight months under ambient conditions in St. Lucie County, and females have been observed to continue laying eggs for at least seven months. Figure 5. Egg of Metamasius mosieri Barber, the Florida bromeliad weevil. Photograph by B. Larson, University of Florida. 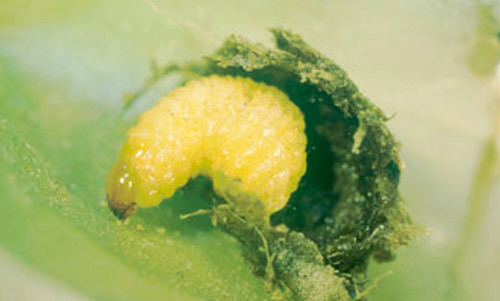 Upon hatching, larvae eat through the outer layer of leaf tissue. Larger larvae, which grow to approximately 11 mm in length, chew through leaves in the center of the plant, less frequently tunneling into the base of the plant as do larvae of the Mexican bromeliad weevil. 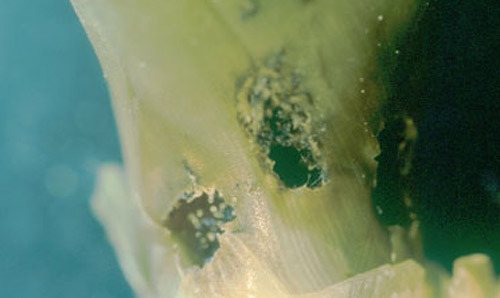 Larvae have also been observed mining the flower stalks of mature plants, without killing them. Figure 6. Larva of Metamasius mosieri Barber, the Florida bromeliad weevil. Photograph by B. Larson, University of Florida. As larvae feed in the center of the plant, they push shredded leaf material up, forming a plug between the leaves, which probably serves as protection against desiccation or natural enemies. 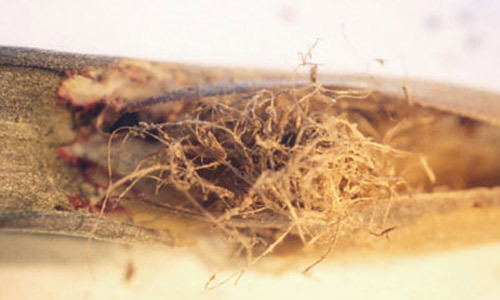 Pupation occurs within the plant, often just below the plug, inside a cocoon constructed by the larva from shredded leaf tissue. Approximate time in the pupal stage under ambient conditions in St. Lucie County has been observed to be two to three weeks. Figure 7. 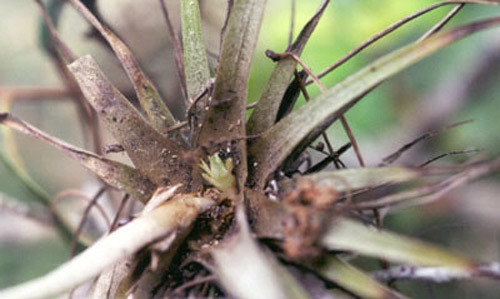 Plug over damage on Tillandsia utriculata (L.) constructed by larva of Metamasius mosieri Barber, the Florida bromeliad weevil. Photograph by B. Larson, University of Florida. Figure 8. 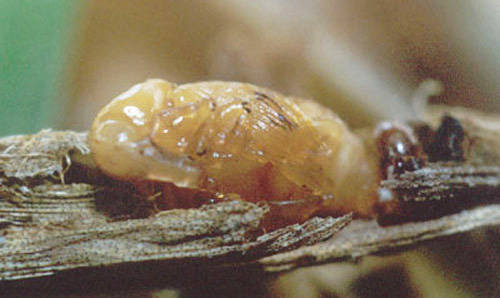 Pupa of Metamasius mosieri Barber, the Florida bromeliad weevil. Photograph by B. Larson, University of Florida. Figure 9. Leaf tissue shredded in preparation for cocoon construction by Metamasius mosieri Barber, the Florida bromeliad weevil. Photograph by B. Larson, University of Florida. While damage to individual plants from Metamasius mosieri is considerably less than that from Metamasius callizona, the Florida bromeliad weevil has been reported killing plants of several native bromeliads in Florida. However, its effects on bromeliad populations are generally insignificant, because the Florida bromeliad weevil is found in low population densities and largely attacks seedlings and immature plants. Greatest damage in natural areas has been observed in St. Lucie County in bromeliad populations already affected by the Mexican bromeliad weevil, Metamasius callizona. The effects of Metamasius callizona presence on population dynamics of Metamasius mosieri are still unclear. In addition to the plug that can be seen in the center of most infested plants, chewing on the base of central leaves serves as a sign of the presence of the Florida bromeliad weevil. Figure 10. 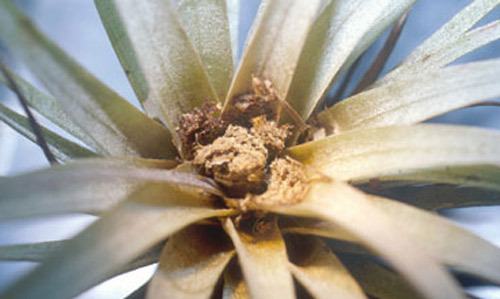 Damage to Tillandsia utriculata (L.) from Metamasius mosieri Barber, the Florida bromeliad weevil. Photograph by B. Larson, University of Florida. Figure 11. Holes at base of stem of Tillandsia utriculata (L.) from Metamasius mosieri Barber, the Florida bromeliad weevil. Photograph by B. Larson, University of Florida. Figure 12. 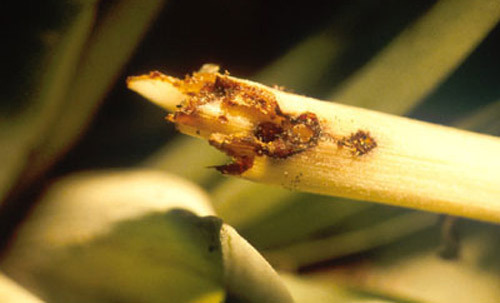 Damage to base of leaves of Tillandsia utriculata (L.) from Metamasius mosieri Barber, the Florida bromeliad weevil. Photograph by B. Larson, University of Florida. In natural areas, the Florida bromeliad weevil does not damage host plant populations enough to warrant management efforts. In bromeliad nurseries or private collections, it is a very infrequent and minor pest. If necessary, it can be controlled with a reduced concentration of an insecticide labeled for beetle adults and grubs, applied as a spray or dip every two to three months to prevent infestations. This recommendation is based on general principles and not on specific efficacy data, as no chemical trials of any pesticide have been carried out against the weevil. Barber HS. 1920. A new tropical weevil from Florida and Cuba. Proceedings of the Entomological Society of Washington 22: 150-152. Cave RD, Duetting PS, Creel OR, Branch CL. 2006. Biology of Metamasius mosieri (Coleoptera: Dryophthoridar), with a description of the larval and pupal stages. Annals of the Entomological Society of America 99: 1146-1153. Creel OR. 2000. Up-close and personal with the evil weevil: One man's encounters with Metamasius callizona. (8 July 2013). Frank JH. 1999. Bromeliad-eating weevils. Selbyana 20: 40-48. Frank JH, Thomas MC. (September 2000). Weevils that eat bromeliads. (8 July 2013). O'Brien CW, Thomas MC. 1990. 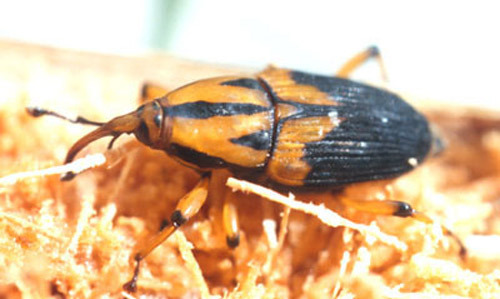 The species of Metamasius in Florida (Coleoptera: Curculionidae). Florida Department of Agriculture & Consumer Services, Division of Plant Industry, Entomology Circular 330. Vaurie P. 1966. A revision of the Neotropical genus Metamasius (Coleoptera, Curculionidae, Rhynchophorinae). Species groups I and II. Bulletin of the American Museum of Natural History 131: 213-337. Publication Date: May 2001. Latest revision: March 2016. Reviewed: February 2019.